Folia lib. » Blog Archive » Paul van Osdol and ‘BX Protocol’ – or: how badly can a ‘journalist’ mess up? Paul van Osdol and ‘BX Protocol’ – or: how badly can a ‘journalist’ mess up? But what is real? What is the REAL facts behind all that? It was me who informed Paul van Osdol about the “BX Protocol” fraud, already in February 2016. It was me who had searched for Paul Taylor, the father of the deceased Terri Taylor, shown in the “long” (only some 6 minutes) video. I had phoned with Paul Taylor and with other relatives and victims of the “BX Protocol” fraud. There is a lot of material which I and some others had dug out. All that material I and some others had given Paul van Osdol MONTHS ago. And what? : Paul van Osdol messes up damned badly. Paul van Osdol messes up so damned badly that one must ask how much he was paid by Dewayne Lee Smith. The videos by WTAE are nothing but a broad advertisement for the BX Protocol fraud. Why so? : One reason: Because they support the conspiracy mania which is the most valuable and most effective tool of the “BX Protocol” gangsters. And there are more very important reasons …! The mounted video pieces inserted into his “report” are a well-chosen selection PUSHING AND ENDORSING the “BX protocol”. If I were van Osdol’s boss I would have fired him on the spot. Paul van Osdol did not even mention Olivia Downie, the best-known victim of “BX Protocol”. Olivia died in 2012. Olivia Downie is a victim of gang member Antonio Jimenez, who runs TWO clinics in Mexico, and who since spring 2016 tries to rig up a “cancer clinic” on Samoa. That very clinic is to apply “German(ic) New Medicine”, the 100 percent lethal dreck “invented” by the German mass murderer Ryke Geerd Hamer who is responsible for HUNDREDS of dead. Antonio Jimenez is a leading gang member of the “BX Protocol” fraudsters. Paul van Osdol did not even mention that the whole stuff sold for moon prices by Dewayne Smith’s gang is useless crap, imported from Asia. It is NOT invented by Dewayne Lee Smith, it is only relabeled. Paul van Osdol did not even mention that the gangsters Dewayne Smith et al is NOT in Hong Kong, but lives in Herriman, Utah. 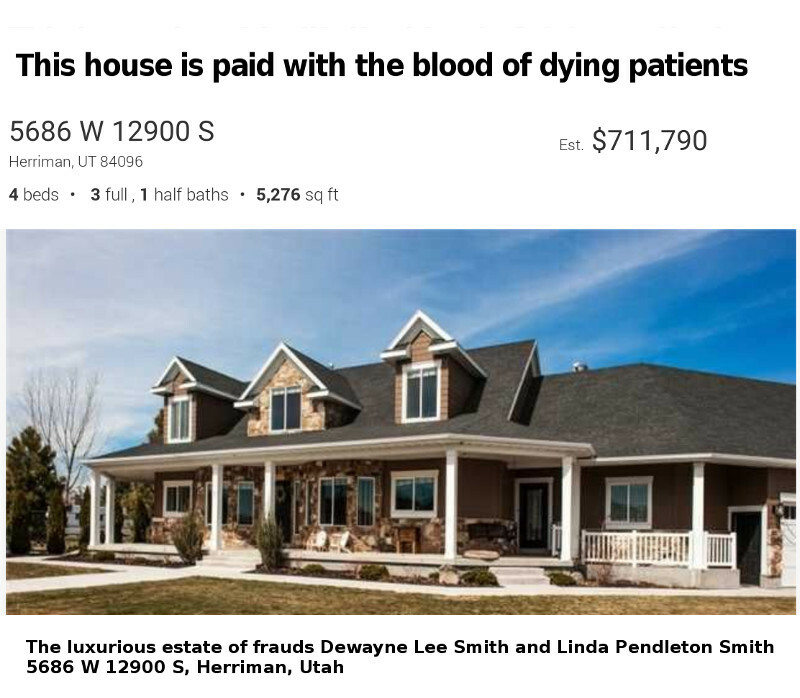 Their addresses known, and public appearances of Smith and his wife Linda Pendleton Smith, who also is a leading gang member, can be found in official local publications of Salt Lake County, Utah. All that data was given to Paul van Osdol! Paul van Osdol did not mention that the “affiliates”, like Valerie Donaldson, Dietrich Klinghardt, Sherri Tenpenny, and others get enormous kickbacks for getting patients sign and pay for the “BX Protocol”: up to 25 percent. 25 percent of the 16995 US Dollars which a patient has to pay for the “BX Protocol” membership! There is more than 500 MegaBytes of compressed data ready for journalists. It was given to them on a silver platter. Why do we do all the investigations when “journalists” like Paul van Osdol are either too damned stupid and/or are paid to cover up? Post Title: Paul van Osdol and ‘BX Protocol’ – or: how badly can a ‘journalist’ mess up?